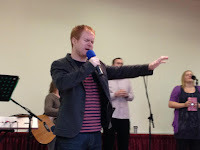 I hope we hear more about that tweet when Andrew comes to speak to us on Sunday fresh from a mission to Mexico with a team from Revive Church, Hull. God was certainly at work. This Sunday come in faith expecting to receive from God - but be prepared to be challenged and inspired too. We are praying that everyone there will have an encounter with God in some way and will go out different. It's an exciting opportunity for us all.